Our little VM can represent three types of values right now: numbers, Booleans, and nil. Those types have two important things in common: they’re immutable and they’re small. Numbers are the largest, and they still fit into two 64-bit words. That’s a small enough price that we can afford to pay it for all values, even Booleans and nils which don’t need that much space. Strings, unfortunately, are not so petite. There’s no maximum length for a string. Even if we were to artificially cap it at some contrived limit like 255 characters, that’s still too much memory to spend on every single value. UCSD Pascal, one of the first implementations of Pascal, had this exact limit. Instead of using a terminating null byte to indicate the end of the string like C, Pascal strings start with a length value. Since UCSD used only a single byte to store the length, strings couldn’t be any longer than 255 characters. We need a way to support values whose size varies, sometimes greatly. This is exactly what dynamic allocation on the heap is designed for. We can allocate as many bytes as we need. We get back a pointer that we’ll use to keep track of the value as it flows through the VM. Using the heap for larger, variable-sized values and the stack for smaller atomic ones leads to a two-level representation. Every Lox value that you can store in a variable or return from an expression will be a Value. For small fixed-size types like numbers, the payload is stored directly inside the Value struct itself. If the object is larger, its data lives on the heap. Then the Value’s payload is a pointer to that blob of memory. We’ll eventually have a handful of heap-allocated types in clox: strings, instances, functions, you get the idea. Each type has its own unique data, but there is also state they all share that our future garbage collector will use to manage their memory. “Obj” is short for “object”, natch. This takes a bare Obj pointer and wraps it in a full Value. Every heap-allocated value is an Obj, but Objs are not all the same. For strings, we need the array of characters. When we get to instances, they will need their data fields. A function object will need its chunk of bytecode. How do we handle different payloads and sizes? We can’t use another union like we did for Value since the sizes are all over the place. No, I don’t know how to pronounce “objs” either. Feels like there should be a vowel in there somewhere. Instead, we’ll use another technique. It’s been around for ages, to the point that the C specification carves out specific support for it, but I don’t know that it has a canonical name. It’s an example of type punning, but that term is too broad. In the absence of any better ideas, I’ll call it “struct inheritance”, because it relies on structs and roughly follows how single-inheritance of state works in object-oriented languages. Like a tagged union, each Obj starts with a tag field that identifies what kind of object it is—string, instance, etc. Following that are the payload fields. Instead of a union with cases for each type, each type is its own separate struct. The tricky part is how to treat these structs uniformly since C has no concept of inheritance or polymorphism. I’ll explain that soon, but first lets get the preliminary stuff out of the way. A string object contains an array of characters. Those are stored in a separate heap-allocated array so that we only set aside as much room as needed for each string. We also store the number of bytes in the array. This isn’t strictly necessary, but lets us tell how much memory is allocated for the string without walking the character array to find the null terminator. Note how the first bytes of ObjString exactly line up with Obj. This is not a coincidence—C mandates it. This is designed to enable a clever pattern: You can take a pointer to a struct and safely convert it to a pointer to its first field and back. Within a structure object, the non-bit-field members and the units in which bit-fields reside have addresses that increase in the order in which they are declared. A pointer to a structure object, suitably converted, points to its initial member (or if that member is a bit-field, then to the unit in which it resides), and vice versa. There may be unnamed padding within a structure object, but not at its beginning. Given an ObjString*, you can safely cast it to Obj* and then access the type field from it. Every ObjString “is” an Obj in the OOP sense of “is”. When we later add other object types, each struct will have an Obj as its first field. Any code that wants to work with all objects can treat them as base Obj* and ignore any other fields that may happen to follow. Pop quiz: Why not just put the body of this function right in the macro? What’s different about this one compared to the others? Right, it’s because the body uses value twice. A macro is expanded by inserting the argument expression every place the parameter name appears in the body. If a macro uses a parameter more than once, that expression gets evaluated multiple times. Then it would pop two values off the stack! Using a function fixes that. These two macros take a Value that is expected to contain a pointer to a valid ObjString on the heap. The first one returns the ObjString* pointer. The second one steps through that to return the character array itself, since that’s often what we’ll end up needing. This takes the string’s characters directly from the lexeme. The + 1 and - 2 parts trim the leading and trailing quotation marks. It then creates a string object, wraps it in a Value, and stuffs it into the constant table. If Lox supported string escape sequences like \n, we’d translate those here. Since it doesn’t, we can take the characters as they are. Once we have the array, we copy over the characters from the lexeme and terminate it. We need to terminate it explicitly ourselves because the lexeme points at a range of characters inside the monolithic source string and isn’t terminated. Since ObjString stores the length explicitly, we could leave the character array unterminated, but slapping a terminator on the end costs us little and lets us pass the character array to C standard library functions that expect a terminated string. You might wonder why the ObjString can’t just point back to the original characters in the source string. Some ObjStrings will be created dynamically at runtime as a result of string operations like concatenation. Those strings obviously need to dynamically allocate memory for the characters, which means the string needs to free that memory when it’s no longer needed. If we had an ObjString for a string literal, and tried to free its character array which pointed into the original source code string, bad things would happen. So, for literals, we preemptively copy the characters over to the heap. This way, every ObjString reliably owns its character array and can free it. I admit there is a sea of helper functions and macros to wade through. I try to keep the code nicely factored, but that leads to a scattering of tiny functions. They will pay off in later chapters when we reuse them. It allocates an object of the given size on the heap. Note that the size is not just the size of Obj itself. The caller passes in the number of bytes so that there is room for the extra payload fields needed by the specific object type being created. Then it initializes the Obj state—right now, that’s just the type tag. This function returns to allocateString() which finishes initializing the ObjString fields. Voilà, we can compile and execute string literals. Don't get "voilà" confused with "viola". One means "there it is" and the other is a string instrument, the middle child between a violin and a cello. 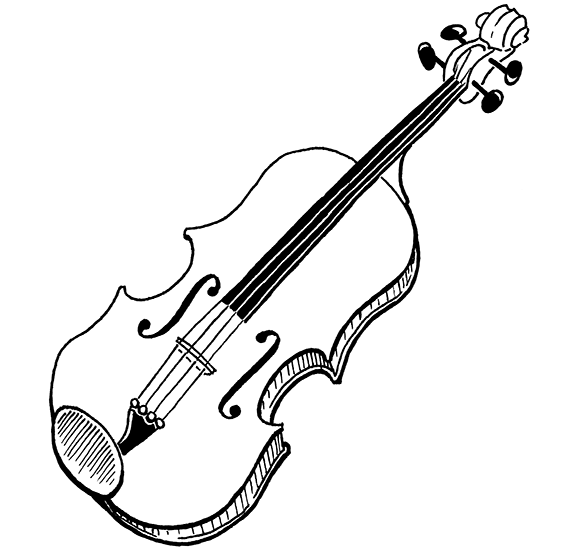 Yes, I did spend two hours drawing a viola just to mention that. We only have a single object type now, but this function will sprout additional switch cases in later chapters. For string objects, it simply prints the character array as a C string. I told you terminating the string would come in handy. If the two values are both strings, then they are equal if their character arrays contain the same characters, regardless of whether they are two separate objects or the exact same one. This does mean that string equality is slower than equality on other types since it has to walk the whole string. We’ll revise that later, but this gives us the right semantics for now. Full-grown languages provide lots of operations for working with strings—access to individual characters, the string’s length, changing case, splitting, joining, searching, etc. When you implement your language, you’ll likely want all that. But for this book, we keep things very minimal. If both operands are strings, it concatenates. If they’re both numbers, it adds them. Any other combination of operand types is a runtime error. This is more conservative than most languages. In other languages, if one operand is a string, the other can be any type and it will be implicitly converted to a string before concatenating the two. I think that’s a fine feature, but would require writing tedious “convert to string” code for each type, so I left it out of Lox. It’s pretty verbose, as C code that works with strings tends to be. First, we calculate the length of the result string based on the lengths of the operands. We allocate a character array for the result and then copy the two halves in. As always, we carefully ensure the string is terminated. The previous copyString() function assumes it cannot take ownership of the characters you pass in. Instead, it conservatively creates a copy of the characters on the heap that the ObjString can own. That’s the right thing for string literals where the passed-in characters are in the middle of the source string. But, for concatenation, we’ve already dynamically allocated a character array on the heap. Making another copy of that would be redundant (and would mean concatenate() has to remember to free its copy). Instead, this function claims ownership of the string you give it. "st" + "ri" + "ng"
The first two instructions push "st" and "ri" onto the stack. Then the OP_ADD pops those and concatenates them. That dynamically allocates a new "stri" string on the heap. The VM pushes that and then pushes the "ng" constant. 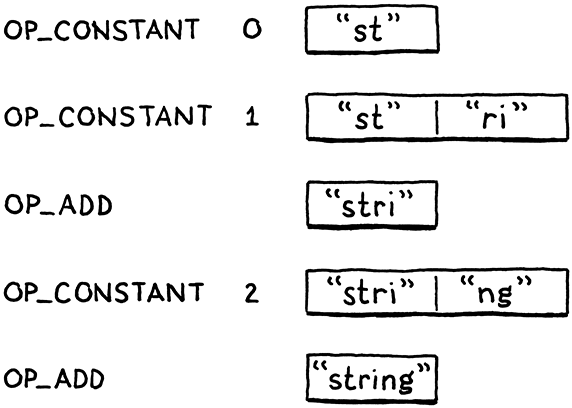 The last OP_ADD pops "stri" and "ng", concatenates them, and pushes the result: "string". Great, that’s what we expect. But, wait. What happened to that "stri" string? We dynamically allocated it, then the VM discarded it after concatenating it with "ng". We popped it from the stack and no longer have a reference to it, but we never freed its memory. We’ve got ourselves a classic memory leak. Of course, it’s perfectly fine for the Lox program to forget about intermediate strings and not worry about freeing them. Lox automatically manages memory on the user’s behalf. The responsibility to manage memory doesn’t disappear. Instead, it falls on our shoulders as VM implementers. The full solution is a garbage collector that reclaims unused memory while the program is running. We’ve got some other stuff to get in place before we’re ready to tackle that project. Until then, we are living on borrowed time. The longer we wait to add the collector, the harder it is to do. I’ve seen a number of people implement large swathes of their language before trying to start on the GC. For the kind of toy programs you typically run while a language is being developed, you actually don’t run out of memory before reaching the end of the program, so this gets you surprisingly far. But that underestimates how hard it is to add a garbage collector later. The collector must ensure it can find every bit of memory that is still being used so that it doesn’t collect live data. There are hundreds of places a language implementation can squirrel away a reference to some object. If you don’t find all of them, you get nightmarish bugs. I’ve seen language implementations die because it was too hard to get the GC in later. If your language needs GC, get it working as soon as you can. It’s a cross-cutting concern that touches the entire codebase. Today, we should at least do the bare minimum: avoid leaking memory by making sure the VM can still find every allocated object even if the Lox program itself no longer references them. There are many sophisticated techniques that advanced memory managers use to allocate and track memory for objects. We’re going to take the simplest practical approach. We’ll create a linked list that stores every Obj. The VM can traverse that list to find every single object that has been allocated on the heap, whether or not the user’s program or the VM’s stack still has a reference to it. Since this is a singly-linked list, the easiest place to insert it is as the head. That way, we don’t need to also store a pointer to the tail and keep it updated. Eventually, the garbage collector will free memory while the VM is still running. But, even then, there will usually be unused objects still lingering in memory when the user’s program completes. The VM should free those too. It’s a tiny wrapper around reallocate() that “resizes” an allocation down to zero bytes. Using reallocate() to free memory might seem pointless. Why not just call free()? Later, this will help the VM track how much memory is still being used. If all allocation and freeing goes through reallocate(), it’s easy to keep a running count of the number of bytes of allocated memory. With this, our VM no longer leaks memory. Like a good C program, it cleans up its mess before exiting. But it doesn’t free any objects while the VM is running. Later, when it’s possible to write longer-running Lox programs, the VM will eat more and more memory as it goes, not relinquishing a single byte until the entire program is done. Each string requires two separate dynamic allocations—one for the ObjString and a second for the character array. Accessing the characters from a value requires two pointer indirections, which can be bad for performance. A more efficient solution relies on a technique called “flexible array members”. Use that to store the ObjString and its character array in a single contiguous allocation. When we create the ObjString for each string literal, we copy the characters onto the heap. That way, when the string is later freed, we know it is safe to free the characters too. This is a simpler approach, but wastes some memory, which might be a problem on very constrained devices. Instead, we could keep track of which ObjStrings own their character array and which are “constant strings” that just point back to the original source string or some other non-freeable location. Add support for this. If Lox was your language, what would you have it do when a user tries to use + with one string operand and the other some other type? Justify your choice. What do other languages do? In this book, I try not to shy away from the gnarly problems you’ll run into in a real language implementation. We might not always use the most sophisticated solution—it’s an intro book after all—but I don’t think it’s honest to pretend the problem doesn’t exist at all. However, I did skirt around one really nasty conundrum: deciding how to represent strings. What is a single “character” in a string? How many different values are there and what do they represent? The first big standard answer for this was ASCII. It gave you 127 different character values and specified what they were. It was great… if you only ever cared about English. While it has weird, mostly-forgotten characters like “record separator” and “synchronous idle”, it doesn’t have a single umlaut, acute, or grave. It can’t represent “jalapeño”, “naïve”, “Gruyère”, or “Mötley Crüe”. It goes without saying that a language that does not let one discuss Gruyère or Mötley Crüe is a language not worth using. Next came Unicode. Initially, it supported 16,384 different characters (code points), which fit nicely in 16 bits with a couple of bits to spare. Later that grew and grew and now there are well over 100,000 different code points including such vital instruments of human communication as 💩 (Unicode Character ‘PILE OF POO’, U+1F4A9). If a user accesses the fourth “character” in “naïve”, do they expect to get back “v” or “¨”? The former means they are thinking of each code point and its combining characters as a single unit—what Unicode calls an extended grapheme cluster—the latter means they are thinking in individual code points. Which do your users expect? How is a single unit represented in memory? Most systems using ASCII gave a single byte to each character and left the high bit unused. Unicode has a handful of common encodings. UTF-16 packs most code points into 16 bits. That was great when every code point fit in that size. When that overflowed, they added surrogate pairs that use multiple 16-bit code units to represent a single code point. UTF-32 is the next evolution of UTF-16—it gives a full 32 bits to each and every code point. UTF-8 is more complex than either of those. It uses a variable number of bytes to encode a code point. Lower-valued code points fit in fewer bytes. Since each character may occupy a different number of bytes, you can’t directly index into the string to find a specific code point. If you want, say, the 10th code point, you don’t know how many bytes into the string that is without walking and decoding all of the preceding ones. An example of how difficult this problem is comes from Python. The achingly-long transition from Python 2 to 3 is painful mostly because of its changes around string encoding. ASCII is memory efficient and fast, but it kicks non-Latin languages to the side. UTF-32 is fast and supports the whole Unicode range, but wastes a lot of memory given that most code points do tend to be in the lower range of values where a full 32 bits aren’t needed. UTF-8 is memory efficient and supports the whole Unicode range, but it’s variable-length encoding makes it slow to access arbitrary code points. UTF-16 is worse than all of them—an ugly consequence of Unicode outgrowing its earlier 16-bit range. It’s less memory efficient than UTF-8, but is still a variable-length encoding thanks to surrogate pairs. Avoid it if you can. Alas, if your language needs to run on or interoperate with the browser, the JVM, or the CLR, you might be stuck with it, since those all use UTF-16 for their strings and you don’t want to have to convert every time you pass a string to the underlying system. One option is to take the maximal approach and do the “rightest” thing. Support all the Unicode code points. Internally, select an encoding for each string based on its contents—use ASCII if every code point fits in a byte, UTF-16 if there are no surrogate pairs, etc. Provide APIs to let users iterate over both code points and extended grapheme clusters. This covers all your bases but is really complex. It’s a lot to implement, debug, and optimize. When serializing strings or interoperating with other systems, you have to deal with all of the encodings. Users need to understand the two indexing APIs and know which to use when. This is the approach that newer big languages tend to take like Perl 6 and Swift. A simpler compromise is to always encode using UTF-8 and only expose a code point-based API. For users that want to work with grapheme clusters, let them use a third-party library for that. This is less Latin-centric than ASCII but not much more complex. You lose fast direct indexing by code point, but you can usually live without that or afford to make it O(n) instead of O(1). If I were designing a big workhorse language for people writing large applications, I’d probably go with the maximal approach. For my little embedded scripting language Wren, I went with UTF-8 and code points.